PHP Operators , Operands and Expression are sets of characters which perform a special task in the PHP code. We use a plus sign ( + ) to add two number together and it is known as an arithmetic operator. Operator can’t do any things without operand and operand is that on which an operator work. For example: 5 + 3 = 8 Here, 5 and 3 are operand & plus sign(+) , equal sign(=) are operators and 5+3=8 is an expression . 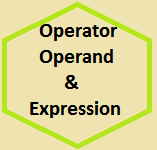 Dear learner in this tutorial i discussed details about PHP Operators, operand and Expression . I Hope everybody must be benefited form this tutorial. True if both a and b are true. True if one or both a & b are true.